BITEPROOF — ISSUE 2 "Cybernetics, Dianetics, and a hypodermic of Mutant genetics"
ISSUE 2 "Cybernetics, Dianetics, and a hypodermic of Mutant genetics"
Contains new and exclusive illustrative work by 20 top artists over 40 colour/black n white pages in a bite-sized A6 format. Artists are from the UK, USA, Italy, and Germany. Each artists has the task of illustrating the title in whatever means they see fit over an A5 double-page spread. Also comes with 2 stickers and a postcard by 3 different artists. BITEPROOF is an independent publication of visual mastication for the mind and eye. The running theme for each issue is in the title. By setting its own brief, Biteproof will bring you unseen, new and exclusive work. Contributors are chosen for their individual and unique style which sets benchmarks at all levels within their genre. A6 in stature Biteproof will show over double page spreads, how a string of quirky words can be transformed into an exciting variety of stylistically original illustrations; giving us a glimpse into how these artists' minds process an initial idea. 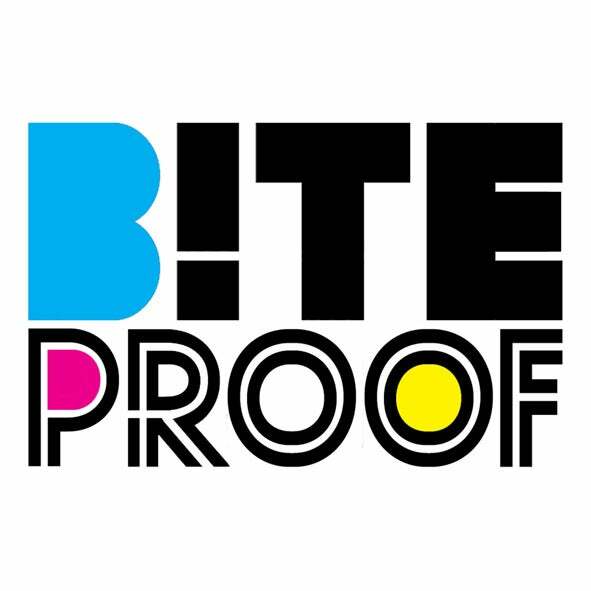 Biteproof will be used as a way of bringing together a vast array of solely UK artists who require and enjoy more of a challenge than just submitting "any old piece of work".